The BMW M6 is a two-door, four passenger sport coupe and a two-door, four passenger sport convertible. There was a time when BMW’s Motorsports lineup contained a full range of vehicles. The M1 supercar was at the top of the list, quickly followed by M editions of the 3-Series, 5-Series and 6-Series. Eventually, the number of M cars available was whittled down so that by the 1990’s, only the M3 and M5 remained. However, seeing the popularity of its Motorsports division increase as M versions of the Z3 coupe and roadster found an excited audience, BMW decided to broaden the horizons of the badge after the year 2000. One of the most ostentatious M cars is the BMW M6. This large, menacing and lightning fast full-size two-door is based on the 6-Series, itself no slouch in the performance department. The M6 eschews the V8 found in the 650i and replaces it with an engine displacing the same 5.0 liters but with an additional two cylinders. This V10 is identical to that which can be found installed in the BMW M5, and it is put to equally good use in the similarly sized M6. Producing 500 horsepower, the M6 also shares the 7-speed SMG transmission with the M5. This semi-automatic unit can be shifted with steering wheel paddles or using the console shifter, and the sequential gear changes are extremely rapid, if a bit abrupt. For those who prefer to trust their right arm over a computer-controlled brain, a 6-speed manual transmission is also available. The M6 can be had as either a coupe or a convertible, with both models demonstrating approximately equal performance. 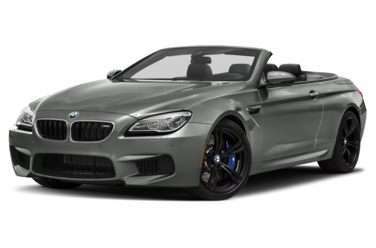 With the top down, the M6 convertible looks even longer than the hardtop version, with the short front overhang coming at the end of a powerful looking, sloping hood. The trunk is designed to function as part of the vehicle’s overall aerodynamics package, rising up from between the rear fenders to add extra down force. While the overall vehicle weight might be a bit on the high side, BMW has made the effort to save mass wherever possible, and this includes fabricating the doors and the hood out of aluminum. Given that these are three of the largest single panels on the vehicle, it was a smart decision on the part of the German automaker. While the M6 is definitely large on the outside, these dimensions do not translate when it comes to providing enough comfortable interior space for four passengers. The rear seats are not designed to accommodate adults for anything other than the shortest of trips. Other than this drawback, the rest of the vehicle’s cockpit is exceedingly well-appointed, with all of the usual M goodies such as voice control over the navigation system, active cruise control and a driver’s side dash-mounted LCD screen which provides important operational information regarding the M6’s performance. The M6 is a luxury coupe and convertible which has power to spare and excellent handling and road mannerisms. While at times it may feel bulkier or somewhat of a handful when compared to either the M5 or smaller M3, it is a difficult package to beat when it comes to combining personal luxury and performance. The 2009 BMW M6 is a carryover from 2008. The ultra-fast 2009 BMW M6 can be ordered in coupe or convertible form, with a single trim available across each. This vehicle uses a 5.0 liter V10 that boasts an awe-inspiring 500 horsepower and 383 lb-ft of torque. A 7-speed automatic transmission with manual shifting capabilities or a 6-speed automatic are the gearbox options, and fuel economy is a low 11 miles per gallon in the city and 17 miles per gallon on the highway for both the coupe and the convertible.